I am hard at work on an outline/synopsis sort of thingy for a new trilogy. I wish I could say it’s a true outline or synopsis, but I’m not an outliner. However, I’m not a panster either, to just start writing and write by the seat of my pants. I am a plan-ster, a person who halfway plans and then writes a while, and then plans again from the new and improved position halfway through the story. While I’m outlining (term used loosely, as just explained), I am finding places where I am stuck. What happens next? One word is changing things: Because. My character argues with another BECAUSE. 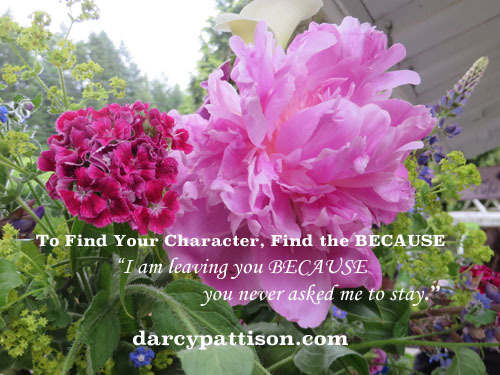 . .
By forcing myself to answer the BECAUSE question, I wind up going deeper into backstory, motivations and emotional depth. Why are they doing such and so? BECAUSE. . .
Backstory. Some of the because has to do with inventing backstory. This week, I found a villain that way. I knew Character V was acting up, but when I added the BECAUSE and started delving into V’s psychology and backstory, suddenly V took on a new–and much more interesting–role in the story. He became the antagonist, which I knew I needed, but I had been avoiding the work needed to figure it out. So, the BECAUSE work became a shortcut to finding out about a villain. Motivations. For all the characters, the BECAUSE work meant I had to delve into the reasons for actions, the motivations. This deepened the story in important ways, even at this outline level. Partly, I am trying to find connections among characters and how they approach life at interesting tangents. As I worked on the BECAUSE answers, I made sure the answers weren’t clones, but held the possibility of interesting clashes. Fiction is about emotional conflict and how that conflict is resolved (or not). Generally, the person who hurts the most should be the main character. It’s not unusual to have to change the MC to a different character as you uncover and create the characters’ inner lives. I am still stumbling around inside the ideas for this story. But one word is lighting a path toward actually writing a first draft: BECAUSE. This was so helpful, Darcy! I’m a “plan-ster” too, and in the same stage right now with a historical fiction novel about 17th century Japan. I’ve been doing research and wondering when I know enough to start writing, so I loved the reminder to do some outlining and then write, and then start again from that new, improved place. Remembering to ask myself the hard, deeper question of “because?” is so helpful. I always love your blog posts but since they come to my email I don’t often comment. I just want you to know that you do a great job! The message is simple, yet powerful. I love the poster with the quote. It’s lovely. Are you considering selling posters with quotes for writers? I hope so.